Kristine is one of five police officers on the team who work security at the Center. Dressed in plainclothes to avoid intimidating any of the children, they try to be as approachable as possible. And while they have an office, Kristine prefers to be with the children, to play and talk to them. “It’s important for children to know their rights, however they should also know their responsibilities,” she said. By staying and working at the Center, Kristine has settled for a lower rank in the police department. With her experience, she could have become a lieutenant colonel by now, however she prefers to keep her job with children rather than move up in rank. “I am not willing to leave my job. At the end of the day, rank isn’t the most important thing to me. I love my job and the Center, and I want to stay,” she said. 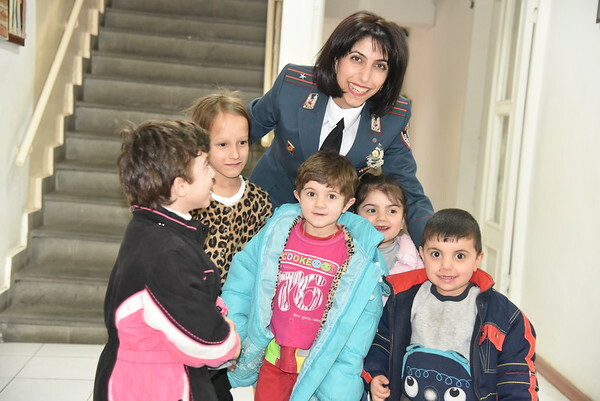 FAR Children’s Center, the only institution in Armenia that performs crisis intervention and rehabilitation, provides a safe shelter for at-risk children through a process of prevention, protection and recovery. FAR Children’s Center is sponsored by the Edward and Helen Mardigian Foundation, the Friends of the FAR Children’s Center (U.S.) and the Children’s Center Circle of Friends (Armenia).